At the heart of this problem is the perception that anyone other than a doctor should be the medical home. All the data and statistics in the world cannot replace the knowledge that comes when a physician knows a patient. The distraction of the patient physician relationship not only is a huge driver in the loss of quality care and increase of cost it is also at the heart of some of the most significant maladies we currently face such as opiate dependence see in mental health challenges. Until we make the doctor the medical home and restore some continuity to the physician patient relationship we will still be playing healthcare Russian roulette. 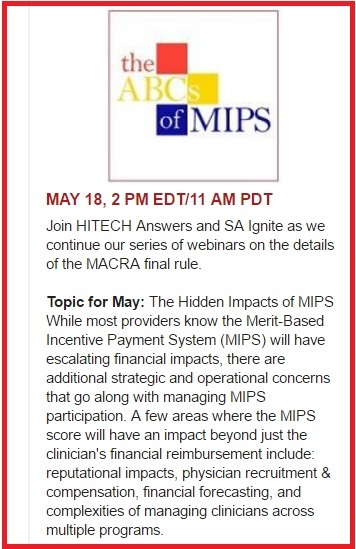 I will bet that in their course they will not mention that “the physician must [participate in MIPS]” is not true. The physician chooses to comply in the hope of getting that 9% increase in Medicare payment. CMS says 47% of physicians will lose the zero sum game of MIPS. Weill Cornel Medical college estimates the cost of compliance with EMR, PQRS, etc to be $40,000/physician/year. As I’ve said before, do the math. You would have to clear $430,000 at a 9% return (if you are in the elite compliers) to reimburse yourself for your compliance costs. Hey, then you’d be rolling in reward money…What a thinly veiled process to gather the data to justify real time treatment dictates. I know of no other profession that would give up their privileged communication without a tooth and nail, knock down drag out fight, except the medical profession. If only because of the disastrous treatment implications of not being able to candidly talk and privately record medical and surgical encounters, it would seem to me that all physicians, in spite of the many compliance courses, should choose to just say no, at least to “interoperable EMR with 24/7 unfettered access” by HHS and CMS, as dictated in the MACRA law. We all need to be opted out as taxpayers, patients and physicians with a full repeal. The Republican Party and congressmen outside of the Freedom Caucus are enabling the liberal Democrat sellout of America by ACA to the insurance, health IT and hospital industries. Unless there is a repeal of all of the limitations on insurance, insurance company bail outs, propped up phony exchanges, and the largest tax increases in the history of our country, we are sunk as a country. We have solutions from the few remaining private practice physicians who are also taxpayers, parents, and community leaders. We can help you and President Trump keep your words and benefit all Americans while saving everyone money. Please inquire!